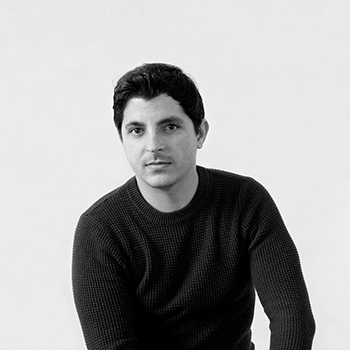 Javier Galindo is an architect and designer based in New York City. He was born and raised in Havana, Cuba. His practice investigates the role of impermanence and fragmentation in architectural discourse and expression. Using form and color as allegorical instruments, the work aims to produce incomplete, ambiguous and simultaneous readings, accompanied by sublime effects. Javier has been the recipient of the 2015 Rome Prize in Architecture from the American Academy in Rome, the 2018 Cintas Fellowship in Architecture and Design, the KPF Traveling Fellowship, and several competition awards and recognitions. His professional experience includes time as Senior Associate Principal and Lead Designer at Kohn Pedersen Fox in NYC, working in the design and construction phases of several national and international urban projects ranging from super-tall towers, residential and commercial mixed-use buildings and masterplans. He has also practiced professionally in other design firms in Miami and San Francisco. As an assistant instructor at Cornell University, he has taught Visual Studies and Representation courses. He is often an invited lecturer and guest critic and his work has been featured in several publications including A+U, Concept Magazine and Threshold journals. He received a Masters of Architecture from Cornell University, where he was the recipient of the Best Thesis Prize, and a Bachelors of Architecture from FIU in Miami.